Thomas Edison provided a similar account of success with his famous quote, “I didn’t fail a thousand times. The light bulb was an invention with a thousand steps.” In a way, the world’s greatest inventions are oftentimes fraught by even greater adversity. The same can be said for Albert Einstein, whose last name has become synonymous with genius. To many, Einstein is the greatest scientist who ever lived. But a unique collection of Albert Einstein’s letters and papers revealed a history of struggle and failure that remind us of his humanity. These documents give us a glimpse into the undercurrents of one of the greatest minds to ever live. Based upon such texts, here are five entrepreneurship lessons anybody can learn from Albert Einstein. Relevance to Innovation : No matter how insightful or gifted you are, or success of the organization – sometimes it’s necessary to recognize others also have these qualities too. This is an opportunity to fast track understanding and progress to move forward. This is especially the case in Disruptive Innovation where nobody has all the answers about the future and the need to periodically challenge assumptions and opinions, not matter how valid theoretically or historically. Sure, you can read just about any book, but when someone reads the right book, at the right time, it can have a truly profound effect on their outlook of life. So, what books could have intrigued Einstein, one of the greatest geniuses to have ever lived? One of such texts was, A Treatise of Human Nature by David Hume, a Scottish philosopher. In one of his letters, Einstein admitted that reading it helped him formulate his famous theory of special relativity. That’s what reading can do for you; it can help you formulate new ideas by reading about the outcomes, actions, and experiences of others. Relevance to Innovation : This is very applicable to Disruptive Innovation since it has a lot to do with connecting the dots – of seemingly unrelated items. Plus the free and unencumbered flow of ideas to ” create the new “. Because of this, Disruptive Innovation typically occurs with ” outside the box thinking ” and outside the enterprise. One of Einstein’s most defining qualities was his ability to conceptualize complex scientific ideas by visualizing extraordinary but potentially real scenarios. He called it thought experiments. Albert Einstein didn’t just pluck his remarkable theories out of thin air. He made many mistakes before ultimately arriving at them, including his iconic equation, E=mc2, that even those who loathe physics find hard to forget. He did all that by being persistent. Before his postulates became widely accepted by the scientific community, Einstein spent decades researching and defending his work. And, once his Special and General Theories of Relativity were proven, Einstein did not stop pursuing additional and more difficult challenges. As his ultimate life goal, Einstein hoped to unite the forces of electromagnetism and gravity under one theoretical framework, which would also incorporate the theory of quantum mechanics. This quest turned into a series of dead ends, remaining still unachieved, which serves as a reminder of Einstein’s genius and ambition. If there were ever an icon of scientific entrepreneurship, that is Albert Einstein. Relevance to Innovation : This is a good reminder that great outcomes are 10 % inspiration and 90 % perspiration ! And and it all starts with some good questions, tenacity, an ability to learn quickly, and a serious intent to produce meaningful results. This approach is critical to having innovation in general deliver better business outcomes. It’s even more important with Disruptive Innovation where the rewards and risks are higher. By the time he was an adult, Einstein had adjusted himself, to a certain degree, when it came to engaging in social matters. As a child, however, Einstein didn’t just struggle in school, he was described by his younger sister as a reluctant talker. Later on, Einstein would reveal that he found memorizing words considerably difficult. Experts such as Simon Baron-Cohen have hypothesized Einstein might have been afflicted with Asperger’s Syndrome (AS), a milder form of autism. Those afflicted with AS are characterized as being socially aloof, emotionally detached and exhibiting socially inappropriate behavior which includes lack of empathy for others and a lack of social and emotional reciprocity. Einstein may have also suffered from non-verbal communication problems, and motor clumsiness. But another aspect of Asperger’s Syndrome is an obsessive interest in a single topic or object. So, while Einstein showed little interest in socializing, he relished in solitude while making good use of his capable mind. So, with his distinct childlike playfulness, endless curiosity and ability to focus, he decoded the universe right before our eyes. Relevance to Innovation : To get past limitations and blind spots, plus benefit from those with high playfulness, curiosity, and focus is why enterprises engage with an ” Innovation Catalyst ” – to increase the rewards from Innovation and to better manage the challenges associated with change. No, I am not talking about the environment as in, global warming. But rather about where and with whom you spend the most of your time. As we can clearly see in the 15 manuscripts and 33 letters penned by Einstein between 1933 and 1954, which were auctioned at the London Antiquarian Book Fair in 2006 for a cool $1.5 million, he struggled as a student. He was clearly not getting anywhere at school, where his ideas often clashed with his professors who were more in tune with the norms rather than thinking out of the box. It was only until Einstein found a job working as a clerk at a patent office that he made significant strides in not only physics, but mathematics and philosophy as well. Point is, negativity breeds negativity. Wherever you wish to spend your time, make sure you are around positive people to get your creative juices flowing. Relevance to Innovation : Like in science, significant innovations can come from anywhere. And when a newcomer emerges in an industry, they can have an advantage since they can focus on ” making the new happen ” – and not continue spending time and resources on perpetuating existing operations, products, services, etc. 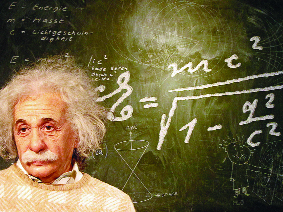 Einstein’s work has changed the way physicists view time, space, gravity and light. He has become one of the greatest scientists in history, alongside Galileo Galilei and Sir Isaac Newton. This is all because, just as he was a genius, he was also persistent through struggles of all sorts, personal and professional. In fact, in many ways, Einstein was a deeply flawed man. Yet he never surrendered as his will and determination were unbreakable. Relevance to Innovation : With there being many examples of ” culture eating innovation for breakfast “, Innovators need to not only be intelligent about ideation, execution, monetization, etc., but also smart about working through the challenges associated with ” the new “. While sometimes Innovation produces impressive results quickly, for innovation to be sustainable there is typically the need for a lot of effort over time – the old story when it comes to doing things that matter ! And a huge incentive for those of us in the Innovation ecosystem to effectively collaborate and leverage our various capabilities to increase the probability of meaningfully improving outcomes from Innovation.